Homemade Flour tortillas are more common in the northern states of México, where they use what we consider to be the BEST recipe for flour tortillas, the traditional recipe of 1 kilo of All purpose flour, 1/4 of a kilo Vegetable Shortening, hot water as needed, a dash of baking powder, and a pinch of salt. Although must cooks will omit the baking powder. 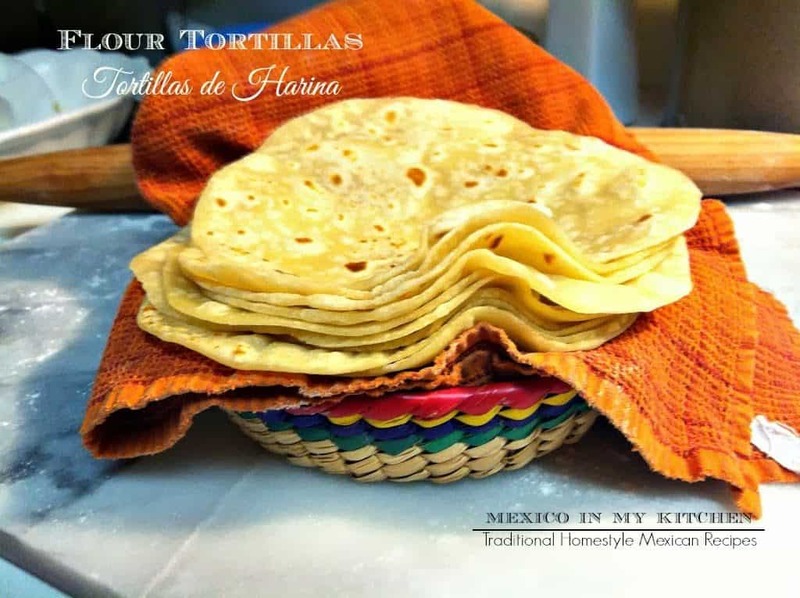 Although nowadays you can conveniently get good quality flour tortillas at the corner store, many housewives prefer to make homemade flour tortillas at home, Like Señora Hortencia Luna, a very sweet lady that used to be my son’s nana in Monterrey, NL. Every day before going to work, she would cook one kilo of flour transformed into flour tortillas for her family. When I asked her why she always made the same amount, she told me that it was the only recipe that anyone knew. Ms. Hortencia was the one that showed me hot to make flour tortillas. In México, it’s very common to find shortening in 1/4 kilo sizes packages and flour in 1-kilo sizes. Please make sure to read all these notes before you start making your flour tortillas, you’ll be glad you did. At the end of the post, you will find the new video with instructions to make 8 flour tortillas. Note 1: Add the water little by little to form the dough since in humid climates a slightly less amount of water will be needed. 2. Slowly add the hot water a little at the time until the dough holds together. Do not add all the water at once. See note above. 3. Turn dough onto a work surface, and knead for a couple of minutes until it is smooth. 4. Divide the dough into 10 pieces rolling every piece on your work surface with the palm of your hand to form a little disk. We call these “testales”. 5. Cover the “Testales” with a damped kitchen towel or plastic wrap, and let the dough rest for 30-45 minutes. Note 2: The resting period will develop the gluten and forming the tortilla disks will be easier. Do not skip this step. 6. After the resting period, place an ungreased griddle/comal over medium heat. Grab your Rolling Pin to start forming the tortillas on a lightly floured surface. If you add too much flour to the surface your flour tortillas will be dry. 7. To form the tortillas place the “testal” (ball of dough)onto the working area and press slightly with your hand, set the rolling pin at the center of the “testal” and press forward without making it to the edge and then press backward towards yourself stopping before the edge. Turn the tortilla 45 degrees (like a half turn) and repeat pressing forward and then towards you. Flip the tortilla and repeat the same process until you have a thin disk of about 10 inches. If you are new to rolling tortillas, be patient, it takes a little practice. 8. Now, place the tortilla on your already hot Griddle or comal. This step is a really quick one: be careful with your timing. a) During the first 20 to 30 seconds, the tortilla starts forming air bubbles and light brown spots will show at the bottom side of the tortilla, b) turn the tortilla, and during the next 20 seconds, more air bubbles will continue to form. c) turn again; at this time the flour tortilla will puff up like in the picture above. This last step will take about 10 seconds. Remove the flour tortilla and wrap with a kitchen towel. Keep making the rest of the tortillas. *Your comal/griddle should be hot enough so that when cooking the flour tortillas the spots are light brown; if they are dark brown too soon then the heat is too high, and if the tortillas take longer to cook then the heat is too low. * To store the tortillas place them in a plastic bag in the refrigerator. * To reheat the tortillas, place them on a hot griddle/comal and warm them the same way you cook them, turning twice. The air bubbles will form again but not as big as when they were just cooking. Homemade Flour tortillas are more common in the northern states of México, where they are still made using a traditional recipe. This step by step tutorial and video will guide all the way in the process to enjoy soft and delicious flour tortillas made by you. You will love them! 2 1/2 cups All Purpose Flour plus extra to form tortillas. In a large bowl, place the flour, baking powder, salt, and mix. With the help of a fork, pastry blender or your hands, incorporate the shortening or lard until it resembles coarse meal. Slowly add the hot water a little at the time until the dough holds together. Do not add all the water at once. See note above. Turn dough onto a work surface, and knead for a couple of minutes until it is smooth. Divide the dough into 10 pieces rolling every piece on your work surface with the palm of your hand to form a little disk. We call these “testales”. Cover the “Testales” in a damped kitchen towel or plastic wrap, and let the dough rest for 30-45 minutes. After the resting period, place an ungreased griddle/comal over medium heat. Grab your Rolling Pin to start forming the tortillas on a lightly floured surface. If you add too much flour to the surface your tortillas will be dry. To form the tortillas place the “testal” (ball of dough)onto the working area and press slightly with your hand, set the rolling pin at the center of the “testal” and press forward without making it to the edge and then press backward towards yourself stopping before the edge. Turn the tortilla 45 degrees (like a half turn) and repeat pressing forward and then towards you. Flip the tortilla and repeat the same process until you have a thin disk of about 10 inches. If you are new to rolling tortillas, be patient, it takes a little practice. Now, place the tortilla on your already hot Griddle or comal. This step is a really quick one: be careful with your timing. a) During the first 20 to 30 seconds, the tortilla starts forming air bubbles and light brown spots will show at the bottom side of the tortilla, b) turn the tortilla, and during the next 20 seconds, more air bubbles will continue to form. c) turn again; at this time the tortilla will puff up like in the picture above. This last step will take about 10 seconds. Remove the tortilla and wrap with a kitchen towel. Keep making the rest of the tortillas. Add the water little by little to form the dough since in humid climates a slightly less amount of water will be needed. Add the baking powder if you live at high altitudes. You can still make the flour tortillas without the baking powder, maybe they won't puff to much, but they will still come out fine. The resting period will develop the gluten and forming the tortilla disks will be easier. Do not skip this step. *Your comal/griddle should be hot enough so that when cooking the tortillas the spots are light brown; if they are dark brown too soon then the heat is too high, and if the tortillas take longer to cook then the heat is too low. * To reheat the tortillas, place them in a hot griddle/comal and warm them the same way you cook them, turning twice. The air bubbles will form again but not as big as when they were just cooking. Do you like flour tortillas? Do you have a special recipe for them? Please share it with us in the comments section. Thanks! PS. If you also want to learn how to make corn tortillas, check this POST. 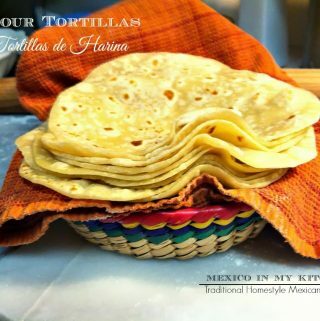 En español Tortillas de harina. These came out perfect! Definitely made me think of being in the kitchen with my abuela as a child. Question – do you think the dough could be refrigerated for a day or so befor cooking after letting the testales rise? I’m glad to know you like them. Yes, you can refrigerate the dough for at least three days. It’s better if you already divided the dough into small balls before refrigerating them. Bring to room temperature before starting to roll the tortillas. Provecho! This recipe looks great! But I would like to replace the shortening with butter. Will I still be able to use 1/3c of butter, or will I need to adjust the measurement? If so, how much should I use? You can use other types of fats, like butter, margarine or oil. You will need to adjust the amounts since each one will affect the dough in different ways. If you prefer to use butter, reduce the amount to half the indicated in the recipe. I have added an egg to my tortillas. They come out more like fry bread a little thicker. Your recipe is close to my grandmothers. Thankyou. So interesting you added an egg to the flour tortilla. Do you mean to the dough? Or to make egg tacos with your flour tortilla? Thank you for this good recipe, Mele. I’ve never actually had a recipe because I learned from my mother, who just threw things in the bowl without measuring. Three common mistakes made when making tortillas are that one, the comal isn’t hot enough, so by the time the bubbles get the right golden color, the tortillas have over cooked and started to dry out. The second thing is that they add too much flour, which makes the dough heavy and tough so the tortillas turn out tough and heavy. And last, allowing them to sit for 30-45 minutes also makes a positive difference. Yes, you are right, so many key elements while making flour tortillas, if we follow those steps our tortillas will be soft, pliable and perfect. How do you know if you’re adding too much flour? Do you mean when you’re rolling them . I’ve tried to make them and followed different recipes but mine always come out too thick and heavy , so I tried again and added more water then they were too sticky and added flour but they still were sticky and falling apart 😩. I’m a great baker and I can make great biscuits or even pie crusts etc . But I can’t get the hang of this I don’t know why ? I know your pain, making flour tortillas takes a little bit of practice and letting the dough rest for at least 30 minutes before rolling the tortillas. Keep practicing, you will see that with time you will get the hang of it. How nice of them! Thanks a lot for letting me know. I made them just as written. They are exceptional! Soft and tender, and they roll beautifully without shrinking back! Perfect for our breakfast burritos of Chorizo con Huevos! I make my own chorizo with pork from my local farmer and local eggs. This morning they were even better with these delicious tortillas! Thank you! Thank you for trying the recipe. So glad to know you like the flour tortillas. Happy cooking! What is another surface to use for rolling the dough besides the wooden cutting board? You can use your kitchen table or your kitchen counter. I tried your recipe last year, but my tortillas came out looking like an elephant ear. I tried again early this month, and still my tortillas looked funny. But, as you mention in your comments. It takes practice. After 3 tries. my tortillas are now round. Thank you for such a tasty flour tortilla. My grandma would be proud. I need help!! My tortillas come out hard/dry every time I’ve tried!! What am I doing wrong?? Mexican here trying to make some homemade tortillas!! Lol please help me, my husband says I’m a fake Mexican because I can’t make tortillas! Try reducing the amount of flour in the dough and also do not add too much or none flour to the surface where you are rolling the tortillas. Just wondering if the cups are US Or metric? I’m in australia so just need to check. Also,I’m going yo use my new tortilla press, will this be ok? The cups are the standard US (one cup equals 236 ml.) Flour tortillas are made using a rolling pin, a tortillas press won’t work. You can use the tortilla press for corn tortilla making. I have used so many of your recipes but I have to reply to THIS ONE! This is the first time I have made my own flour tortillas. I am a Mexican-American, American born young woman but my family never made tortillas or really much from scratch. So, I am learning about my culture’s food through YOU. These by far were the best thing that I have had… I am brought to tears thinking about the women who came before me and made these with their hands. Thank you for providing me with a gift of my ancestors! Cheers to you. Treasure what you learn and pass it on to your kids. Thank you for taking the time to write your kind comment. You just made my day! These tortillas are great! It’s the only recipe I use when I don’t have to be eating gluten-/grain-free. Instead of shortening or straight lard, however, I use my leftover bacon grease from fantastic, high-quality bacon. It makes them delectable! And how does your tortillas came out? Hi Mely, I’ve tried several of your recipes and they’ve all turned out great. My husband absolutely loves your charro beans! He likes them best when I use Carnitas as one of the meats. But about this flour tortilla recipe… It’s great! And I know that because it’s the same recipe I’ve used for 40 years. It does take practice for them to turn out perfect. Mostly it’s about not making the dough too dry and making sure the griddle is plenty hot because if it’s not hot enough, the tortillas dry out and get stiff before the bubbles get golden brown. I also add the water slowly, letting the faucet run very low. And when I feel the dough is starting to hold together, I stop adding the water. The next recipe of yours, that I’d like to try is your churro recipe. I’ve been using mine for years but yours justmight be better! Thanks for all your great recipes that I get in my emails. I like the rolling pin in your pictures, where can i buy one like that?